At this point we do not have extra info-material in English, so please feel free to contact us about any information you would like to know. 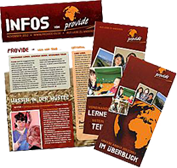 Should you speak German also, you may order our Updates in form of a flyer that holds different articles about our work. This flyer is being printed twice a year. Mandatory field Data protection* I have read and understood the Datenschutzerklärung and agree that the data I provide will be collected and stored electronically to answer my request.